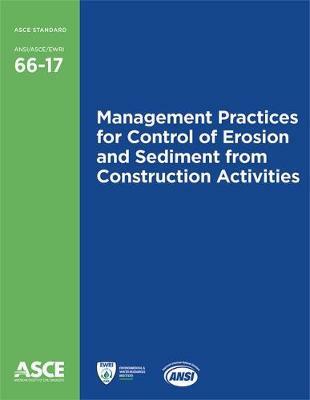 Management Practices for Control of Erosion and Sediment from Construction Activities, Standard ANSI/ASCE/EWRI 66-17, establishes guidelines for controlling accelerated erosion caused by human activities at construction sites. Uncontrolled erosion is costly and accompanied by a host of financial, legal, and environmental problems. This Standard provides tools to ensure that the discharge of sediment does not significantly increase at a construction site compared with preconstruction conditions. Standard 66-17 offers step-by-step guidance for state and local officials looking to establish effective and cost-conscious programs to manage erosion and sediment. Topics include:Sediment and erosion problems associated with construction activities;Regulations and permitting at federal, state, and local levels;Processes associated with erosion and sedimentation, and concepts for site planning;Concepts, practices, and standards for erosion and sediment control, including water conveyance measures, inlet and outlet protection, temporary in-stream measures, and dewatering practices;Erosion and sediment control plans, including plan components, preparation, site plan development, and evaluation;Guidance for specific construction situations, including road, utility, large and small commercial or industrial developments, and large- and small-scale residential developments; Inspection and maintenance; andEnforcement.Appendixes provide a model ordinance, a summary of U.S. regulations and programs, contacts for state erosion and sediment control regulatory agencies, a glossary, and a reference list. Standard 66-17 serves federal, state, and local environmental regulators, building code officials, construction managers, and site owners with straightforward guidance to minimize the effects of erosion and sediment near construction sites.